MOSCOW, Russia -- Ukrainian filmmaker Oleh Sentsov, who is serving a 20-year prison term in Russia, has said he believes he will be transferred to Russia's northernmost prison camp near the village of Kharp in the Yamalo-Nenetsk Autonomous Region. 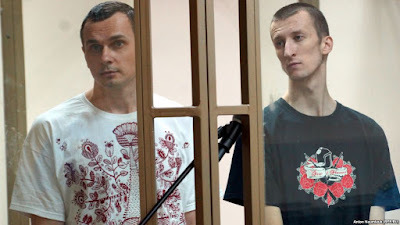 Ukrainian filmmaker Oleh Sentsov (L) and his co-defendant Oleksandr Kolchenko on trial in a Russian court in 2015. Sentsov made the claim in a letter to Russian journalist Zoya Svetova that was received on September 29 and made public on September 30. The letter was dated on September 17 and mailed on September 21 from a remand prison in Tyumen. Sentsov's whereabouts have been a mystery since early this month. Members of a public oversight commission in the Far Eastern city of Irkutsk reported on September 9 that Sentsov had been transferred from that city to the Urals city of Chelyabinsk. However, defense lawyers have had no idea of his location since then. "Physically, no one touches me," Sentsov wrote. But you know well that this system can in perverse ways punish and torment a person without the use of brute force." A Russian court convicted Sentsov and co-defendant Oleksandr Kolchenko in 2015 of planning to commit terrorist acts in the Ukrainian region of Crimea, which Russia illegally annexed in 2014. The two men deny the accusations. Sentsov was sentenced to 20 years, while Kolchenko received a 10-year term. In the run-up to the annexation, Sentsov was a local leader of the Euromaidan movement that forced Ukrainian President Viktor Yanukovych out of power. During the Crimea crisis of February and March 2014, he helped to deliver food and other supplies to Ukrainian troops who were trapped on their bases in Crimea by Russian forces. He publicly stated that he did not recognize Russia's presence in Crimea. Western governments and leading rights organizations have called for Sentsov and Kolchenko to be released. The Russian human rights center Memorial considers both men political prisoners. Russia has refused two requests from Kiev to hand over Sentsov and Kolchenko. In December 2016, Russian President Vladimir Putin said that "conditions [for their release] must be ripe."